A big ol' WHO THE HECK IS THAT?!?!?! 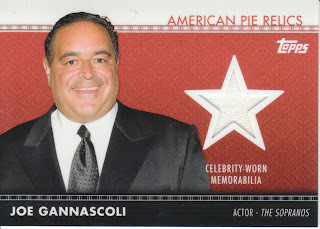 As someone who doesn't watch and didn't watch The Sopranos, this is just another Italian guy smiling at me from a piece of cardboard... whatever, nice try American Pie, I don't consider this guy a "celebrity". The O's are Alfred Hitchcock, John Wayne and James Cagney. The Y is Gary Cooper. If you have one to offer, please let me know the letter and the subject as there are a few subjects she isn't interested in having as part of the Frankenset. Bring it on card traders, I'll trade baseball for American Pie! You can't beat that! If you're looking for American Pie, we have a huge stack of base to help you complete your set, as well as we are trading any and all of our "Hirsute History" and "Fads and Fashions" inserts. We also have our hobby box "Buy Backs" of Evel Kenevel and Captain Kirk for trade. Any of the American Pie "hits" are available: Tia Carrere, Gilbert Gottfried, Vincent Pastore, and Joe Gannascoli fabrics and a John O'Hurley autograph! I still need to collate my AP cards, but if I have anything she needs I'll let you know. I'm casually building the set as well, but I have no clue at this point what percentage of the set I have. My wife baked an apple pie yestereday if that will help! I do have a few of those, I'll check.